1. Prepare Garden Fresh Basil Pesto (this can be prepared ahead of time and refrigerated). 2. Prepare cabbage: Wash thoroughly. Remove core and any hard center pieces of cabbage. Julienne cabbage into thin strips similar to pasta. 3. Heat a wok or large skillet on medium-high heat. 4. Once heated, add cabbage and dry cook for 3-4 minutes, until the cabbage begins to wilt. Don't let the cabbage char or brown. 5. Once wilted, add 3 tablespoons of Garden Fresh Basil Pesto to the cabbage, and mix through using tongs. 6. 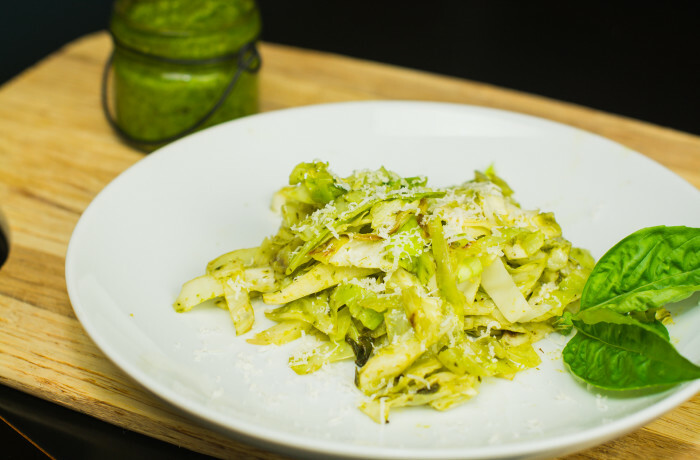 Continue to coat the cabbage with pesto until mixed thoroughly, and saute the cabbage in the skillet for another 2-3 minutes. 7. Plate the cabbage, and top with grated parmesan, as desired. 8. Enjoy topped with grilled chicken, salmon, shrimp or even tofu!